The purpose of this article is to provide an overview regarding the impact of the FASB Accounting Standards Codification – Topic 606, Revenue from Contracts with Customers (ASC 606) on For Profit / Manufacturing entities. This article, and the related articles, provides a brief overview of ASC 606 and omits requirements specific to public entities and many optional disclosures for non-public entities. ASC 606 and related guidance should be referred to for additional information and detail. 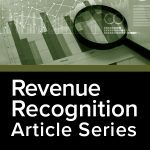 The new revenue recognition framework is effective for non-public entities presenting U.S. GAAP financial statements for periods beginning after December 15, 2018, and interim periods within annual periods beginning after December 15, 2019. Early application is permitted for non-public entities one year prior to the aforementioned effective periods. For entities presenting IFRS financial statements, the framework is effective for annual periods beginning on or after January 1, 2018. Identify the performance obligation(s) in the contract. Allocate the transaction price to the performance obligation(s) in the contract. Transfer of a promised good or service to a customer in satisfaction of performance obligations results in revenue recognition. This occurs when the customer obtains control of the good or service. A contract with a customer may create legal rights and obligations whether or not the contract is in writing. The rights and obligations under the contract may, in turn, give rise to contract assets and contract liabilities. Contract Assets: Commonly referred to as unbilled receivables and progress payments to be billed. A contract asset is an entity’s right to consideration in exchange for goods or services that the entity has transferred to a customer. These assets arise when goods or services have been transferred to a customer but customer payment is contingent on a future event. Contract Liabilities: Commonly referred to as deferred revenue and unearned revenue. A contract liability is an entity’s obligation to transfer goods or services to a customer for which the entity has received consideration from the customer. The proceeding content provides a practical application of the new guidance using hypothetical scenarios to explain certain contractual arrangements common to manufacturing entities. XYZ Company designs and manufactures equipment, provides contract maintenance services, and sells supplies and other components to its customers. On January 1, 2019, XYZ enters into a contract with a customer to transfer equipment and perform maintenance services for three years to a customer. The contract requires the equipment to be delivered first for consideration of $6,000. Consideration for maintenance services amounts to $2,000 per year. Total contract price amounts to $12,000 and is invoiced annually on January 31, in the amount of $4,000 per year. The resulting allocation of the transaction price to each performance obligation on a stand-alone selling price basis results in 20 percent of the revenue ($2,400) allocated to the equipment, and 80 percent of the revenue ($9,600) allocated to the maintenance. On January 1, 2019, the customer receives the equipment and pays the entity $4,000. Alternative A – The following journal entries are made to account for the contract. Alternative B – XYZ would allocate cash to the satisfied performance obligations (the equipment and the satisfied portion of the maintenance) while recording the remaining consideration due associated with the satisfied performance obligation as an unbilled receivable. Essentially, not presenting a contract liability for maintenance paid for by the customer before performance. The following journal entries are made to account for the contract. Note: The Contract Asset and Contract Liability are netted to $0 for reporting purposes. 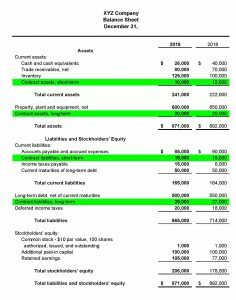 Note –Contract assets and liabilities are reported net in the financial statements for each contract or each group of contracts and would result in a net contract liability for Alternative A of $3,200 ($9,600 less $6,400) along with the receivable of $1,600 and for Alternative B of $0 ($8,000 less $8,000 along with a payment in excess of billings of $1,600. Both cases result in a net overall liability position of $1,600 representing cash received in excess of obligations delivered. XYZ sells two-year service contracts to its customers for the maintenance of equipment. The services are performed evenly throughout the life of the contract. Contracts do not provide for any renewal provisions. Sales agents receive a one-time commission of $500 per contract sold. A sales agent successfully negotiates contracts with three customers during the month and, in doing so, incurs $1,000 of costs for travel, food, and lodging. XYZ also pays the sales agent a salary of $4,000 per month. The sales agent’s salary and the $1,000 costs for travel, food, and lodging are expenses that XYZ would incur whether or not the contract was obtained; therefore, are expensed as incurred. XYZ would record an asset for the $1,500 commission ($500 x 3 contracts) and amortize the asset over the life of the contracts. XYZ may choose to record three separate assets of $500 for each contract or utilize a portfolio approach and record one asset of $1,500. Based on these circumstances, the contracts are similar and a portfolio approach was deemed appropriate. Assume the same facts in the previous example except that after one year into the two-year term of the contracts, the contracts are re-negotiated and XYZ will only receive remaining consideration of $2,000. On the date of renegotiation, the asset’s carrying value is $750 and the costs to provide the services for the remainder of the contract are $1,500. The firm would recognize an impairment loss on the asset in the amount of $250 (expected consideration of $2,000 less costs of providing the services $1,500 = $500. Asset or contract carrying value $750 – $500 = $250 impairment loss). Refer to the following article for further information regarding contract costs: Costs to Obtain or Fulfill a Contract With a Customer. 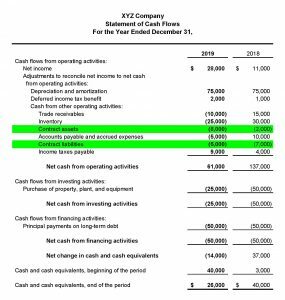 XYZ generates revenue primarily by delivering supplies, manufacturing and installing equipment, and performing maintenance services for customers. Revenues from the sale of supplies and equipment is recognized when the supplies or equipment are transferred to the customer, the customer obtains control of the component (risk of loss passes to the customer), no significant obligations remain, and estimation of return liabilities is reasonably estimated. Progress billings and up-front payments received as part of a contract to manufacture equipment are deferred until control of the equipment transfers to the customer based on contract terms. Revenue is recognized from performance of maintenance services when the services have been provided or delivered. Furthermore, revenue from performance of maintenance services are recognized only if the collectability is likely and the fees charged are determinable. Sales of components and services are evaluated in order to recognize revenue based on the net amount earned as revenue. For multi-element contracts, including the sale of equipment and installation, we allocate revenue to each unit of accounting based on each unit’s relative selling price. Contract liabilities represent payments received from customers prior to the satisfaction of the corresponding performance obligations. Contract liabilities are recognized as revenue once the corresponding performance obligations are satisfied based on the contract with the customer. Contract assets represent the Company’s right to consideration based on satisfied performance obligations from contracts with customers. The changes in the contract balances occurred in the ordinary course of business. Many entities and their accountants will find the implementation of the new revenue standard to be challenging. Even if an entity determines that based on the transaction cycle, amounts of revenue recognized would not be affected by the new standard, certain disclosure requirements will be necessary. If you have questions on how the new revenue recognition will affect your entity, Selden Fox can help. For additional information please call us at 630.954.1400, or click here to contact us. We look forward to serving you soon. Michael T. Kram is a CPA and Vice President at Selden Fox. He performs financial statement audits, reviews, and compilations and provides consulting and tax services for an array of clients in multiple industries. Will Your Entity Be Affected? Are You Ready for the Annual Audit?